Today is a day for looking all around you and seeing how the world offers infinite possibilities. It’s a day for painting your own canvass and creating your own destiny, courtesy of a lovely Mercury / Neptune trine and the Three of Wands from Dana Driscoll’s fabulous Tarot of Trees. Moving ahead means you may be leaving something behind. Something like a dull dreary existence or a reality that no longer suits you. It may mean taking a risk, striking out toward unchartered territories and expanding your horizons so far and wide that you not only don’t know where the road you’re on leads, but are ready to make your imprint on it wherever you go. The Three of Wands is a card of expectation and anticipation. It’s says that you’ve already started to hit your stride. It says you’ve already done the groundwork and are now ready to strike out and make all that you’ve dreamed of a reality. It’s about opening the door to possibility and setting your sites on distant horizons. What can I do with what I already have to make a difference in the world? What do I have to offer that will bring the greatest reward? These are the questions you want to be asking yourself right now. The Three of Wands encourages you to push past your limitations and expand your worldview. It will mean stepping outside of your comfort zone and exploring uncharted territories. And while you may run into pitfalls or have to take detours along the way, know that these are often blessings in disguise that can open you up a whole new world of opportunities. Today it’s going to be all about getting in touch with your intuition, listening to your inner voice and exploring the intricate workings of your psyche. The High Priestess — this version from Daba Driscoll’s beautiful Tarot of Trees — represents a need to turn inward and look for the deeper meanings in your life; it challenges you to look beneath the surface and find hidden nuggets of information that can help you round out the vast reservoirs of knowledge you already possess. It speaks of insight and awareness, psychic perceptions and intuition, and a sense of “knowing” even when there is not a factual basis for it. 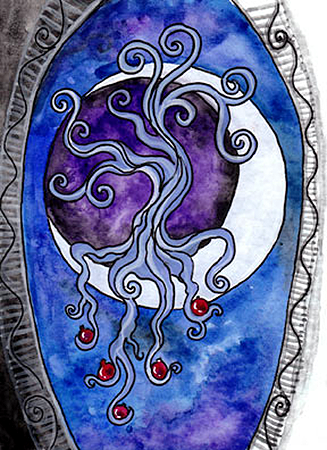 In this version of the card, the High Priestess is represented by an ornate and mysterious tree, seated in a crescent Moon and framed by twin pillars which curve around it like an all-seeing eye. The tree’s branches curve intricately up toward the heavens while the roots hold pomegranates, which are seen as fertility symbols in some cultures and forbidden fruits in others. This is a good day for standing out in a crowd and showcasing your many talents. Whether you’re trying to make an impression at work or are hoping to leave your mark on the world in other ways, you should have no problem making your presence known. 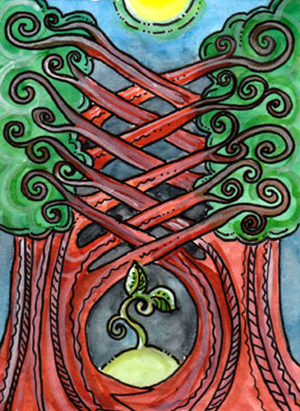 The Queen of Wands — this version from Dana Driscoll’s Tarot of Trees — is warm, vibrant, confident and creative. She knows how to lead with her heart and to garner the respect of others. She embodies the feminine or yin aspects of Fire (wands) energy: warmth, enthusiasm, energy and drive. She’s regal and majestic; dynamic and refined; confident and authoritative. She’s creative, expressive and passionate. She’s also very worldly and knowledgeable. She may be someone in your life, an event or a part of yourself. She may be a supervisor, a parent, a friend or even some facet of yourself that has long been dormant. 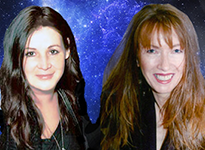 If you’ve been hiding in the shadows or downplaying some of the more expressive aspects of your personality, now is the time to step up and be seen. The Queen of Wands encourages you to get out there and put your best foot forward, in whatever capacity you can. You may feel like things are starting to come together for you today as you see your plans beginning to fall into place. It’s a good day to put your head together with like-minded people and work on bringing a project to fruition. 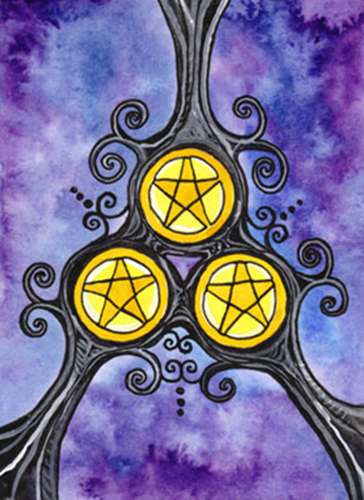 The Three of Pentacles is a “teamwork” card, among other things. This card is about hitting your stride and seeing the early results of something you’ve been working hard on. Sometimes you need help to take it to the next level, even if that comes in the form of a critical eye. The Three of Pentacles — like all Threes — refers to the initial stages of progress where you’ve taken an idea (the Ace), put it into production (the Two), and see it turning into something of value (the Three). This version of the card — from Dana Driscoll’s gorgeous Tarot of Trees — depicts this energy beautifully in its stark simplicity. 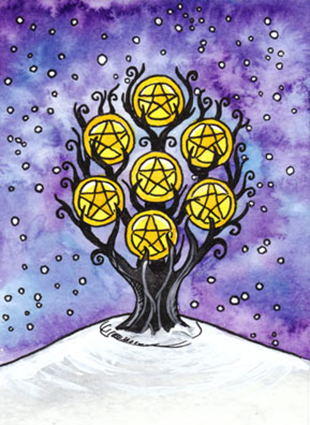 The three trees merge together in the center, their pentacles melding into one and supporting one another at the top. The Three of Pentacles says that you’re making progress and should be feeling good about what you’ve accomplished so far. But there’s still work to be done, and you won’t be able to do it alone. It’s a good time to reach out to others and ask for help if you need it. It can’t hurt to offer it to those who’d benefit from your assistance too. You may need a little push to get past a hump, or you may need the discerning eye of someone you trust. What if money really did grow on trees? And what if it were so plentiful that there was always enough to go around? 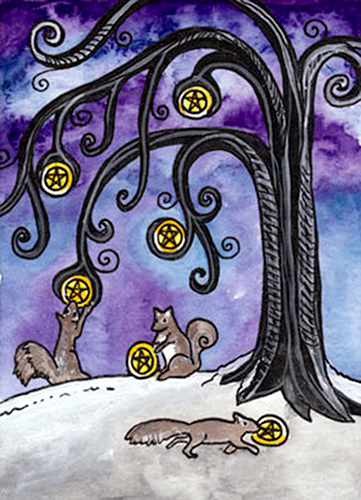 This seems to be what’s happening here with the Tarot of Trees version of the Six of Pentacles. These little guys look like they are squirreling it away for the winter. And of course it’s always wise to be resourceful. But there’s something more valuable here than just the unexpected windfall. There’s the joyful act of sharing rather than just grabbing it all for yourself. Front and center in this card is the consummate “giving tree.” You can imagine that if you reached up and plucked a gold coin from one of its branches that another one would grow in its place. And this is attitude you want to take with you today: that there is always enough for everyone and that prosperity and abundance can be continuously replenished. An important feature of the Six of Pentacles is also gratitude. Noticing the small miracles and blessings that surround you as well as the bigger ones. And honoring those who’ve helped you along the way. Today is a day for both giving and receiving. It doesn’t have to be money or material things; it can be as simple as a smile, a hug, a pat on the back or a moment of your time. Be conscious of all that you receive as well, and don’t forget to say thanks! You may not feel like you’ve got much energy today, or maybe you’re just lacking in motivation. A hard (square) aspect between Mercury and Neptune can bring on feelings of apathy or disillusionment, and can delete your energy levels if you’re not careful. This aspect is good for fantasizing, daydreaming or tapping into your creativity (such as free-style poetry, music, dance or art), but not so great for applying any of those things to your mundane existence. You may be more sensitive to any kind of external stimuli, and more susceptible to being deceived — even if that means deceiving yourself. It’s not a good time to make promises or decisions or to sign contracts. 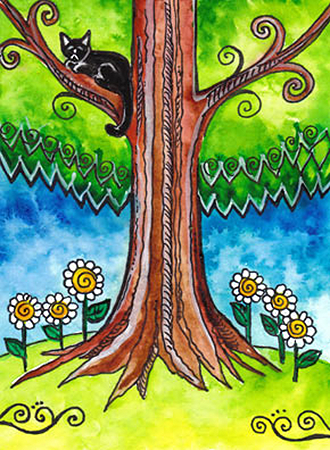 The Four of Cups — this version from Dana Driscoll’s Tarot of Trees — is associated with melancholy, apathy and indifference. This doesn’t mean that whatever you desire is lacking — in fact the Cups in this card are not only full but they’re all overflowing. The water (emotions) that pours from one cup to the next doesn’t flow back to its source. Even though they’re seated right next to an ocean, the water spills out onto the ground and is wasted. The Tree pulls its limbs away from the cups and in toward its own center. 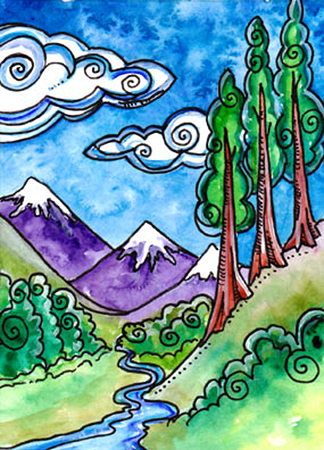 But notice the spiral symbols that are repeated throughout the imagery in this card — from the tree’s limbs, to the ocean’s waves, to the clouds in the sky, to the bough of flowers on the ground. This is a theme of centeredness that speaks more about autonomy and fulfillment than it does of discontent. With this in mind today, you want to work on finding your center today, and pulling your energy inward rather than allowing it to scatter to the wind. Whether the Four of Cups manifests for you as disillusionment or personal fulfillment, will depending on how successful you are at achieving that aim. It may feel like it’s all work and no play for you today, especially with the Full Moon opposing Mars. 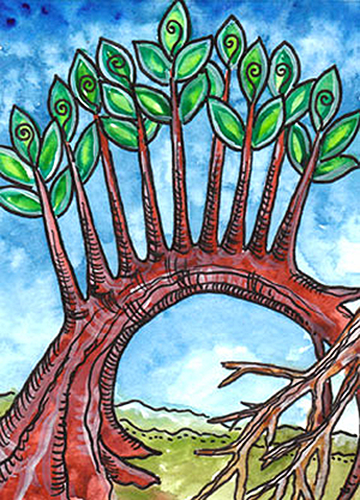 — the Ten of Wands from Dana Driscoll’s gorgeous Tarot of Trees — emphasizes responsibilities and duties which have become priorities, forcing you to deal with them rather than devoting your time and energy to what you really want to do. Today’s Mars / Pluto inconjunct may have you feel overburdened and oppressed. The weight of responsibilities you’ve taken on may seem like a heavy load — too heavy in fact for just one person to carry. The Full Moon is in tense aspect to Mercury and Mars as well, increasing the potential for added irritability and tension. You may also feel like you’re carrying “extra baggage” — whether this refers to your own struggles or those of someone else. There’s a strong possibility you’ve taken on someone else’s problems, rather than letting them iron them out themselves. As a result, it may feel like you’re carrying the weight of the world on your shoulders, with no time or energy left to attend to your own needs. The Ten of Wands encourages you to lighten your load: you’ll have to find a way to nurture your own ideas, needs and interests, or risk seeing everyone else’s problems interfering with your progress. Today’s Moon / Jupiter conjunction in Leo should have you feeling good about your home, family and the life you have built for yourself. 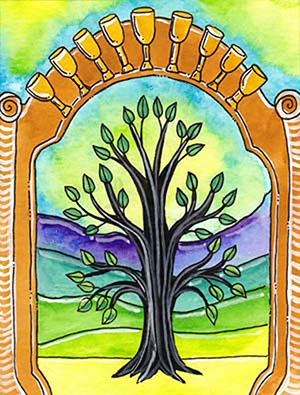 This aspect — along with this gorgeous version of the Ten of Cups from Dana Driscoll’s fabulous Tarot of Trees — is about family, camaraderie, hospitality, togetherness and benevolence. It’s about joining together with like-minded people to create a reality you can be proud of. It refers to arriving at a place in your life where you can fully acknowledge and celebrate the relationship you’ve developed, whether these are family relationships, social connections relationships, friendships or love affairs. The tree in this card didn’t grow to such heights overnight. It’s been tended to over the years, just as your relationships with others must be tended to.And like those relationships, it’s taken a central place in this card, framed by an archway lined with 9 golden cups. The 10th cup is the tree itself, into which all of the love, kindness and gratitude has been poured. The Ten of Cups refers to achieving something that is worth acknowledging and celebrating, as seen here in the imagery of this card. It’s about fulfillment and security; a solid foundation of abundance and prosperity, and the sense that you have built something you can take pride in. Take time today to let those nearest and dearest to you know how important they are. While the Ten of Cups is also said to indicate the culmination of something, that doesn’t mean you’ve come to the end of the road. This card is all about embracing all you’ve established through your connections and interactions with those who matter most — with your family, friends and loved ones. Venus enters Cancer today and brings with it an outpouring of emotion that may take you by surprise. Venus in Cancer is sensitive, loving, gentle and kind. It’s also nurturing and very compassionate — and more than willing to express its feelings of love and affection for others. The Page of Cups refers to a sense of child-like wonder and enthusiasm that prompts you to throw caution to the wind and follow your dreams. It’s an exuberant, unrestrained and joyful energy that stems from the expectation that you’ll succeed, rather than worrying that you might fail. 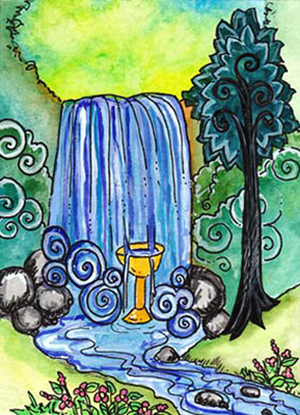 In this version of the card — from Dana Driscoll’s exquisite Tarot of the Trees — a golden chalice rests at the base of a waterfall, surrounded by a verdant landscape of wildflowers and trees. The water fills up the cup and spills over, just as emotions are likely to spill over today. 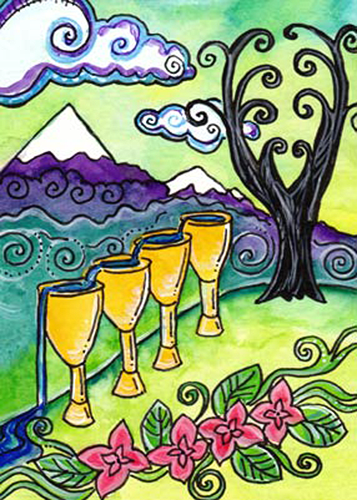 The Page of Cups captures this wellspring of emotions with a childlike, youthful exuberance. There is no fear or hesitation. There’s only a willingness to feel and to share those feelings with whatever lucky recipient comes your way. Pay attention to the messages your receive today — it could be a letter or a phone call, or it could be words of encouragement or appreciation from others. Whatever it is, know that it’s spoken from the heart with no expectations or agendas. Don’t underestimate the power of your own words either. As the Page of Cups can be unfiltered, you want to make sure that you mean what you say today, and that you’ll mean it still tomorrow. Today’s Mars / Uranus conjunction also squares Pluto. This is an intense and potentially cataclysmic transit that ties in perfectly with the Tower card. The Tower — much like this aspect — refers to abrupt and unsettling changes that can take you outside of your comfort zone, through the sense that everything happening around you is completely outside of your control. 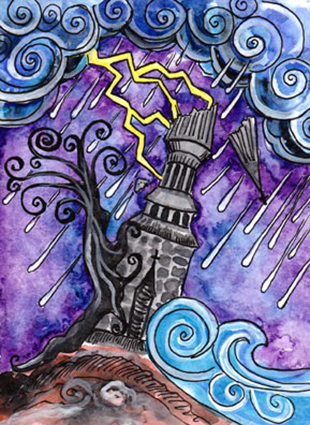 In most versions of the card the “tower” is a literal fortress that’s been struck by lightning and is crashing to the cliffs below. People are falling out of the structure while flames and smoke shoot from the shattered windows. In this version it’s storming and the tower is in danger or falling into the sea. It’s also already partially destroyed, never to be fully restored. A tree has uprooted itself and is hanging on for dear life while the world crashes down all around it. Yet if you consider the source of the destruction — the one earth shattering lightning bolt — you can see how it lights the whole sky, making everything momentarily clear. You may feel like your carefully-constructed world is falling apart or that all you’ve held near and dear (and previously thought was indestructible) is no longer capable of sustaining you. And you’d be right. But look closely at the card and you can the makings of another tower deep within its recesses. It tells you that all is not lost here afterall, and that there is still hope for renewal. Don’t let things get on top of you today. With Venus inconjunct Jupiter today you may feel the need to fine-tune some of the relationships in your life, or figure out a better way to communicate your needs. This may be something large or small… from a family disagreement over the past few days to you just feeling out of sorts and also feeling out in the cold. This type of feeling can have you wanting some alone time and this is perhaps the best thing you can do for yourself today. It will do you no harm and it may also help you look at what you would like to do next. There is a sense of sunnier climes overlapping this image so what you feel now can be changed in a heartbeat if you were to extradite yourself from what is troubling you. Although the Seven of Pentacles is usually about hard work… the type of work that you are possibly a bit bored with and seems to go on forever. This card however, gives a different view of the Seven of Pentacles. The view it gives is that even though you may be bored or feel as if you are alone and no one is supporting you there is still a place “within” you that you can escape to and dream. A place where you are not so burdened down and you have new and exciting opportunities before you. The very fact that you can see new and exciting opportunities no matter what is weighing down you today is the message behind this image. No matter how bad things seem they will improve and it doesn’t hurt to take yourself out of life for a while to dream on what you wish for.